Nine in the morning on a sunny Sunday. I am greeted by Mafalda’s sweet hug in the Oitavos golf course. I move my shoulders in circles to warm them up. I imagine a thin thread that runs from a tree bordering the fairway and my ball, as my teacher taught me. I take a deep breath and let my driver swing. I follow the white sphere until it comes to a halt to the right of the fairway. Mafalda’s turn is up. Her ball falls as far as mine but closer to the centre. We walk with our clubs and chat about work and family. Spring has awakened the grass enveloped in bird songs and sea breezes. I am not sure what I like best about this sport, the challenge of playing against oneself or the exuberance of the greens that surround me for a few hours. We approach the flag. Mafalda, more experienced, manages a par in five strokes. It takes me seven. Not bad for someone who hasn’t played for the last three weeks. I mess up my swing on the tee off to the second hole and the ball is buried under pine straw. I note it as lost and hit another one. Pity. Every once I a while mistakes happen. 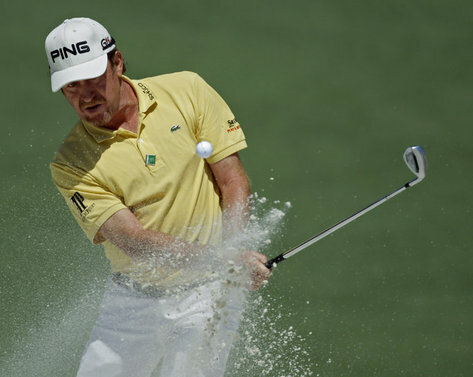 Mickelson himself missed two tee-offs at Augusta National. Augusta. Four days during which the planet’s golf elite comes together in an exuberant golf course, one of the most prestigious in America. The fairways surrounded by magnolias and old elms, the bridges over quiet waters and the stands brimming with excitement before Tiger’s reappearance after five months away from the greens. The weather dresses up in fineries and the sun shines over Georgia, in the heart of America. Tiger Woods in the 2nd hole bunker. Augusta, the course that witnessed the birth of the man who would change the face of golf forever. Tiger and was the youngest winner of the Masters with the best score in its 67 years and he would come to wear the green jacket a total of four times. Tiger Woods, number one in the world’s ranking. I can’t help but hold my breath every time he hits the ball. Nor can I restrain a howl when an easy stroke becomes a torment. Tiger, a man of virtue and vice. It’s surprising that he reached the fourth place under such media scrutiny. 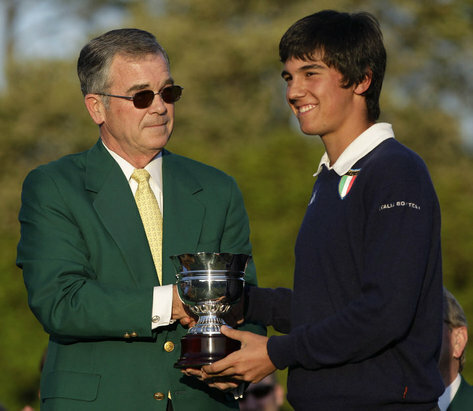 Augusta, a final that offered a succession of unbelievable strokes. Holes in one, two and three strokes brought forth a tide of ovations. The inspiration of a group of geniuses: Choi’s patient and quiet game as he accompanied Tiger’s ups and downs all week; Kim’s feat, who dropped 7 strokes to claim 3rd place; Manassero’s surprise in making the cut on Friday at the early age of sixteen; the happiness of Jimémez, the best placed Spanish player who finished 12th and especially Westwood’s impeccable game, leader after three rounds, who only gave way before Mickelson’s supremacy. Phil Mickelson, whose game, both confident and precise, led him to wear the desired green jacket for a third time. 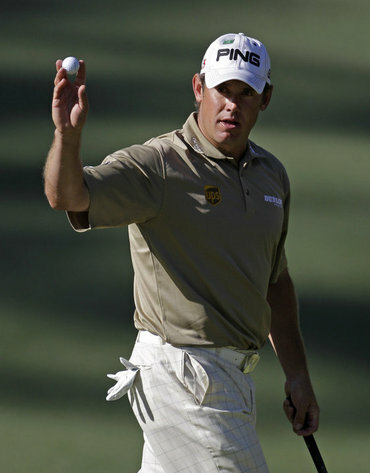 Sixteen under par, a heroic exploit equal to that of his wife’s battle against breast cancer. How beautiful the image of Mickelson hugging Amy at the end of the Masters. I prepare a 36 foot putt on the 9th hole’s undulating green. I hit the ball imagining a bucket of water meandering into the hole. The ball turns slowly, gains speed at the break and falls towards the darkness with a rap. I can hardly believe it. Mafalda gets her par and we happily high-five. We finish the game early, I have to clean up and prepare the luggage. I fall on the grass and feel its dense weft on my back which welcomes me with the softness of a jacket. Of a fresh, green jacket. My stay in Cascais is coming to an end. Not so the memory of another perfect day on the greens. 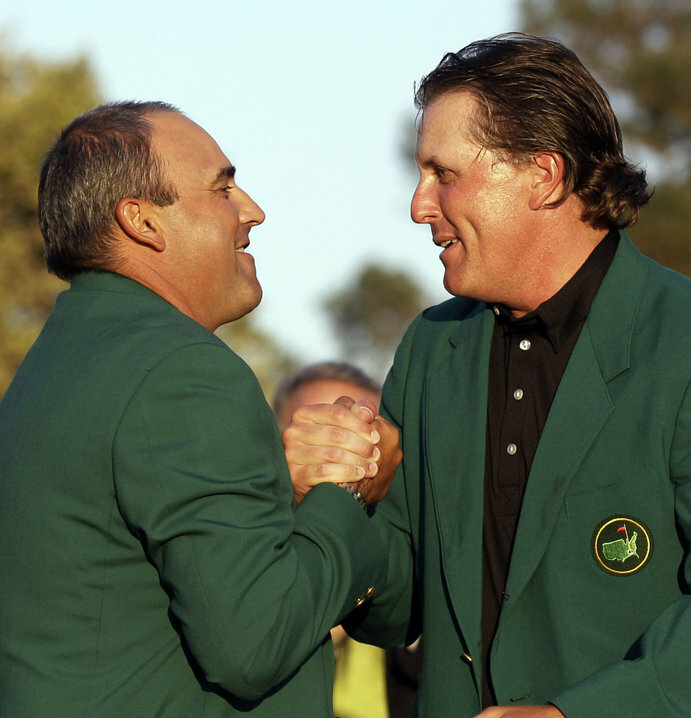 Angel Cabrera, defending his last year title, greets Phil Mickelson after winning Augusta’s Masters on April 11th 2010 in Georgia. U.S.A. Photo: Associated Press. 5 hours a day, 4 days in a row….and yet, Augusta National went by like the breeze stirring the willow trees. Part of me hoped we would get rain, or hail or SOMETHING that would somehow make it last longer. Good things really do end all too quickly. However, having Tiger back makes it all worthwhile! US Open, here we come! What an enthusiasm!. I wish The US OPEN brings again the best of our favourites.